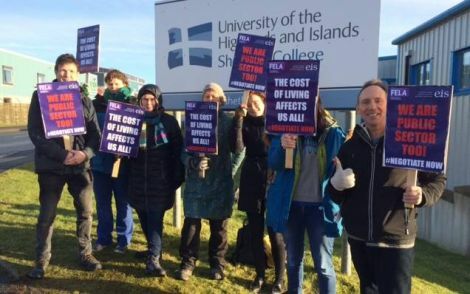 AS THE pay dispute at Scotland’s further education colleges continues, lecturers at Shetland College joined their colleagues at Inverness, Perth and other locations on Tuesday morning and went on strike for the second time this year. The walkout is the result of a long running dispute in which members of the EIS-FELA union are seeking a “fair cost of living pay increase”. Employer Colleges Scotland has expressed disappointed that the union is pressing ahead with the strike while talks to resolve the issue are ongoing. The EIS is asking for an increase in wages that reflects the rise in the cost of living, while Colleges Scotland said that increase had already been granted as part of pay harmonisation for the period from 2017 to 2020. An amended proposal submitted by the union had been turned down by the employers’ organisation , the EIS said on Tuesday. “The EIS is asking only for a fair cost of living increase, similar to that already awarded to college support staff and also in-line with public sector pay policy,” the union’s general secretary Larry Flanagan said. John Gribben of Colleges Scotland responded by saying: “It is disappointing that the EIS-FELA has not suspended strike action whilst negotiations are ongoing. We have met with the EIS-FELA on ten occasions to discuss pay and will be meeting them again on Thursday (7 February) to try and end this disruptive strike action. “As we have repeatedly said to the EIS-FELA, the pay increases over 2017-20 from harmonisation are directly connected to the current additional pay offer on the table over the same three-year period and cannot be separated – a pay rise is a pay rise irrespective of where it comes from. If the dispute can’t be resolved further strikes are planned for Wednesday, 6 March, and Thursday, 21 March.